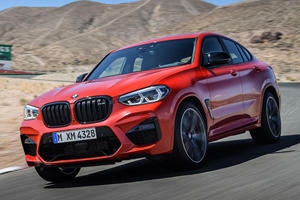 Alongside its X3 M sibling, the 2020 BMW X4 M was revealed as the German carmaker’s latest model to be reworked by BMW M GmbH. The coupe-styled crossover now carries an M badge, which means more power, aggressive styling and higher price tag. Under the hood sits a 3.0-liter twin-turbo straight-six powerplant rated at 473 hp and 442 lb-ft of torque, upping to 503 hp (and the same amount of twist) in Competition guise. The stylish SUV is swift off the line as a result, with 0-60 mph coming in a 4.1 seconds (the Competition manages it 0.1 seconds quicker), while top speed is electronically limited to 155 mph, or 177 mph for the Competition. 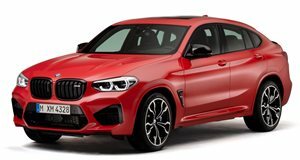 As well as a reworked engine, the X4 M benefits from adaptive suspension, electromechanically variable steering, and massive brakes housed in 20-inch alloys. 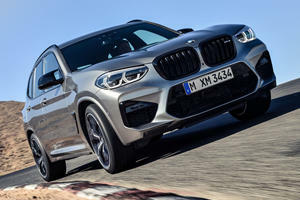 Aggressive styling sets the X4 M apart from the X4, while pricing starts from $74,395, which is almost $4,000 more than the arguably better looking and more practical X3 M that launched at the same time. The 2020 BMW X4 M is set to go on sale in April. Here’s how much of a premium you’ll be paying over the M40i variants of the X3 and X4. The M division's first compact crossovers go hunting for AMG GLCs.